I am fascinated by common stones. This flat one comes from our beach and was sliced & polished. 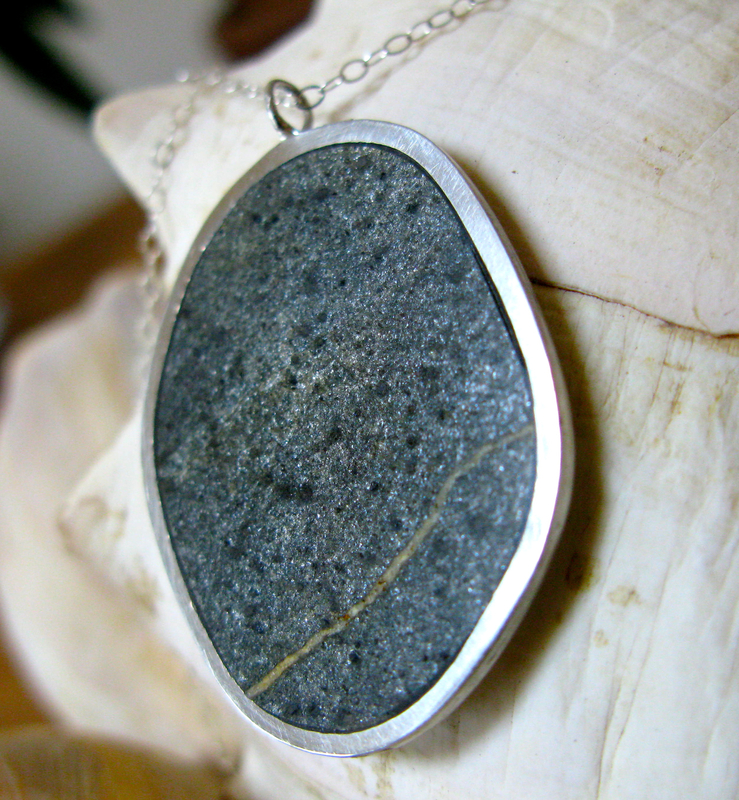 It is set in a very thin silver bezel and it hangs on a very delicate chain. 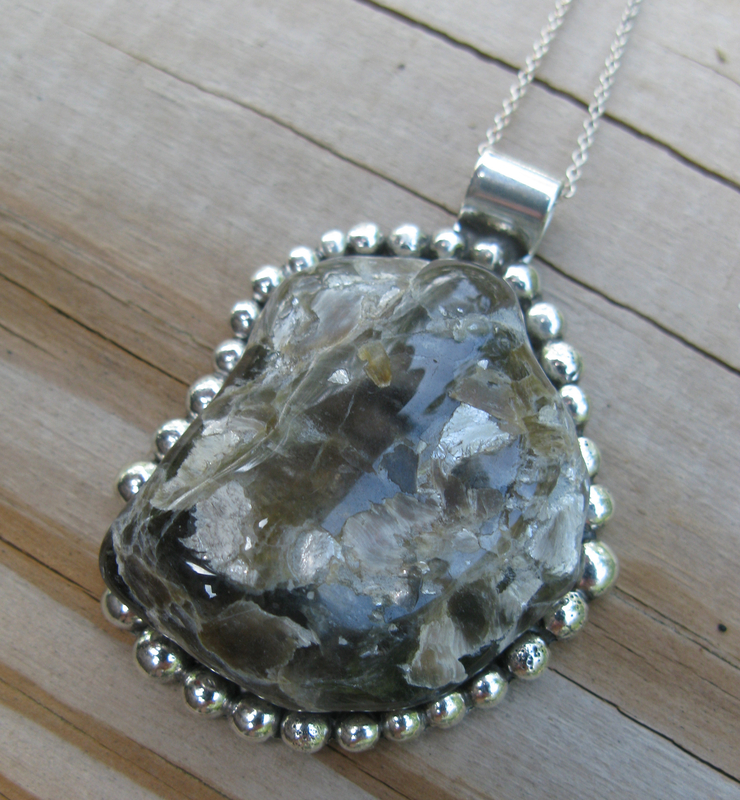 Here is another beachstone, this one with glittering flakes of mica. It is set on a silver plate and framed by silver nuggets. Gifted to Maria. This is a heart pendant in solid 14 K gold on a gold link chain. 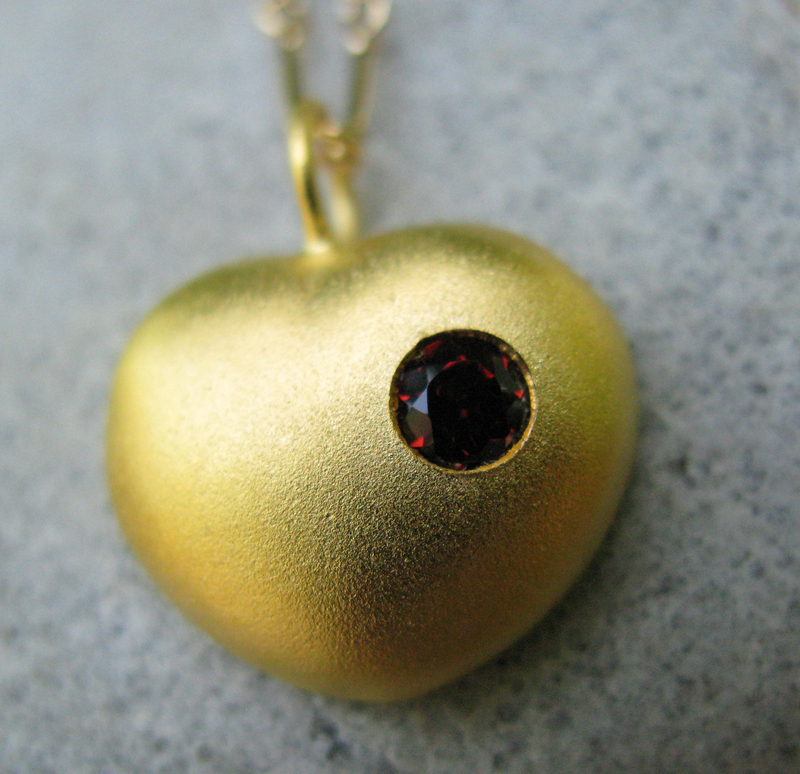 It was designed after the necklace featured in “Love Actually” a very funny British movie. This one has a garnet, but rubies work well too. The gold finish is sand blasted. This makes the gold look matte and thus the bling of the stone pops out! 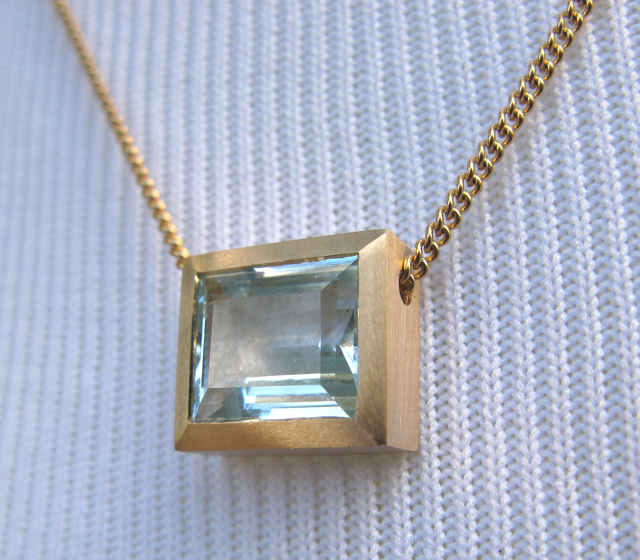 A beautiful aquamarine (emerald cut). These gems are expensive, clear and transparent, and blue. It is one of my favorite stones. The setting is a simple frame in brushed 14 K gold and the chain runs right through it. Gifted to my little sister. 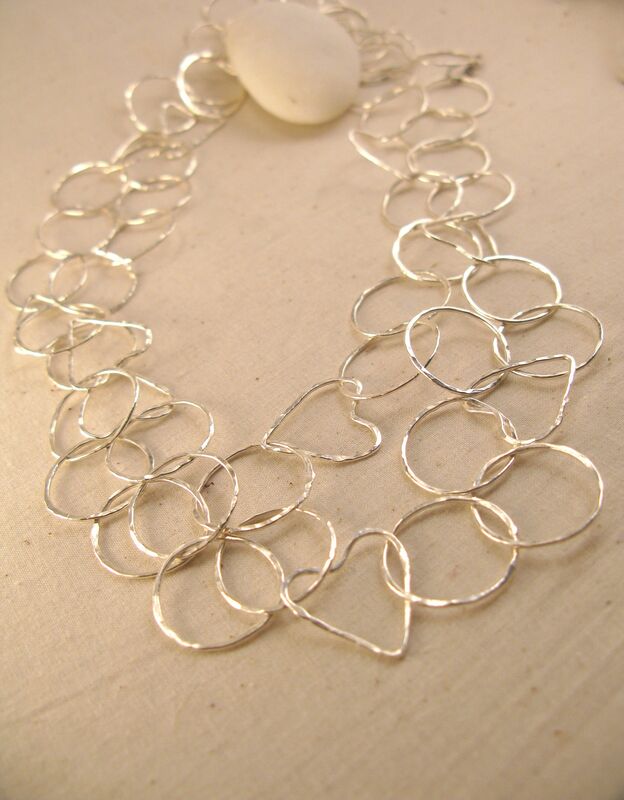 Fine silver hammered links, some in heart shapes. This is a 60 inch chain that can be wrapped up to 3 times around the neck. Fine silver can be fused (as opposed to Sterling which must be soldered) – its a nicer look and it does not tarnish! Tiny diamonds in the rough each drilled like a bead. 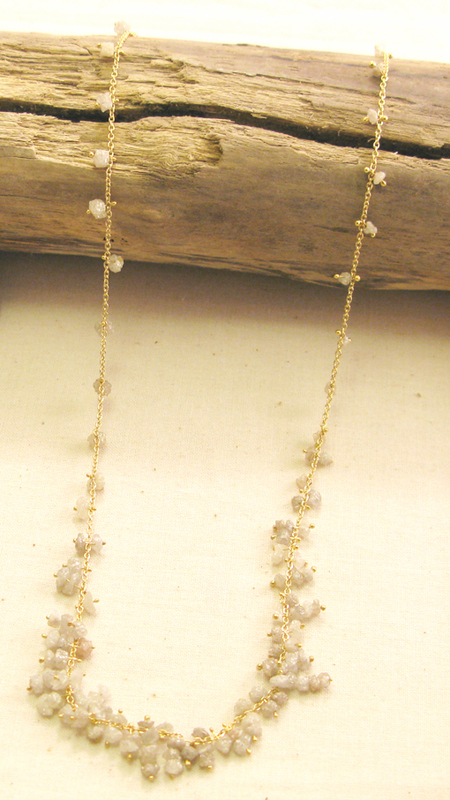 They are attached to an 18K gold chain with tiny little gold rods. A labor of love to produce this delicate piece. 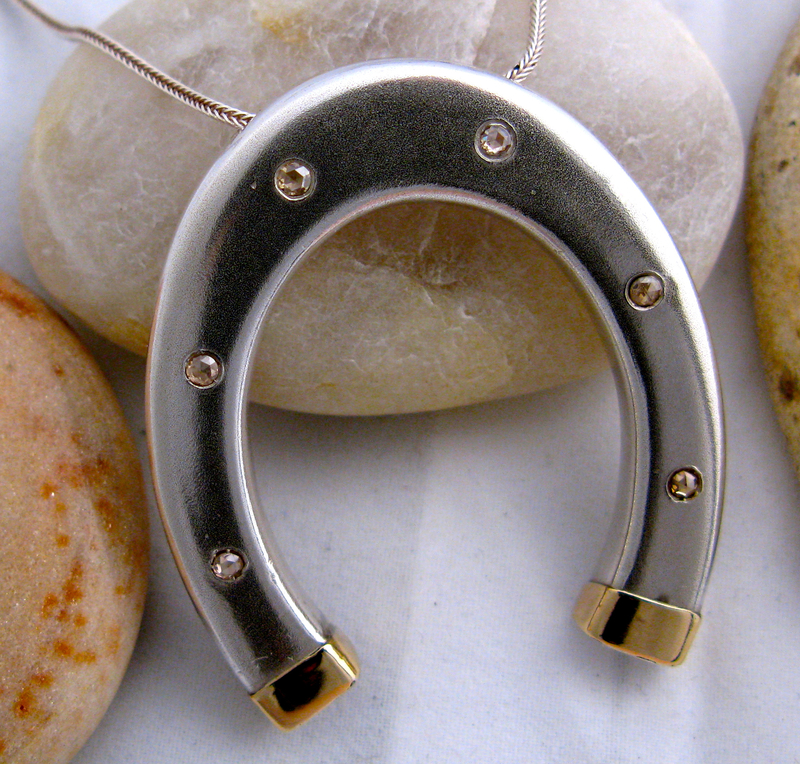 Horseshoe pendant in gold and silver with 6 champagne diamonds. The piece is about 1.5 inches tall and hollowed in back, but still quite heavy (like a real iron horseshoe). I like horses. Along time ago I dreamed of being a vet! 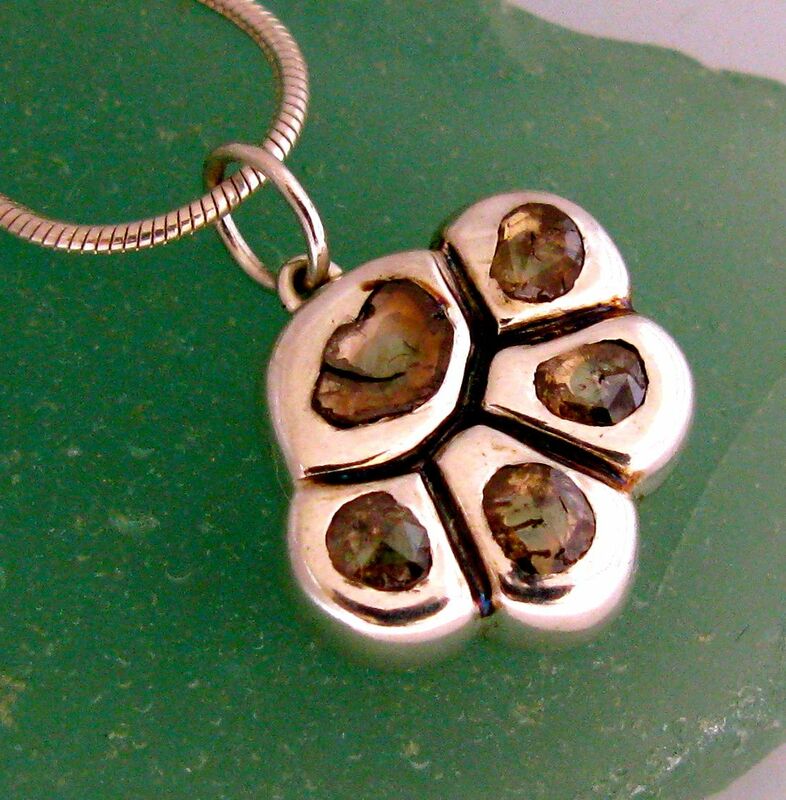 Silver dog paw with brown diamonds. Reminds me of my dog Kenda! Every now and then I get a chunk of gem stone like this turquoise from the Cusco (Peru) market where they sell you a mined rock for a dollar! 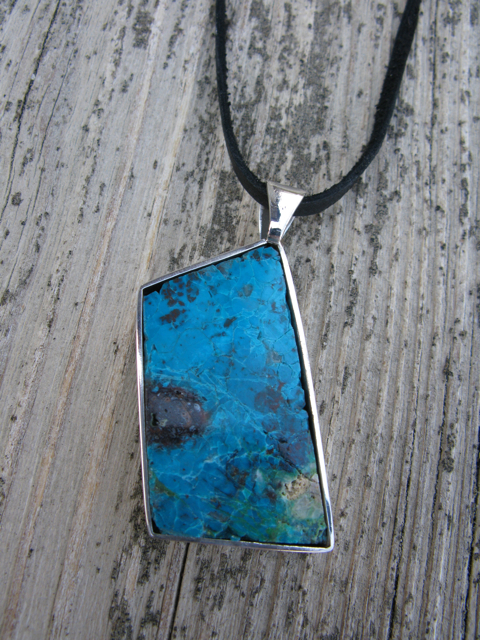 I cut a slab and mounted it in a silver bezel and added a black leather neck band. Belonged to my friend Kate who loved turquoise. Is the#3 necklace the gold heart still available and how much is it? Yes it is. It comes in gold plated (thin coat of 22K yellow gold over a silver base) or as solid 14K yellow gold, as depicted here. It also comes with either a ruby or a garnet, the latter is depicted here. The ruby is slightly more pinkish in color, more authentic, and I have a few in stock. For more info on prices ($US 200-500 range) and for what is currently in stock, check our ETSY store. Love Actually is my favorite movie of all time. How can I possibly order this necklace? I truly love it and cannot stop thinking about it.